The Maharashtra government continues to use a 2002 list denying over 50 lakh of below poverty line (BPL) people who barely earn enough for one meal a day, access to food, despite the fact that local bodies have sent fresh lists for 2012 to the state. That this is being done by a government, which used targeted public distribution system for all poor, as a major plank in its 2009 campaign to come into power is baffling, say activists working for food security. Many like Kishor Tiwari president Vidarbha Jan Andolan Samiti(VJAS) point out how this violates Supreme Court (SC) guidelines in its 2001 order (while hearing a PIL by People’s Union for Civil Liberties) asking state governments to update BPL lists in keeping with local civic bodies’ lists. “We found this out when the government submitted an affidavit to the Nagpur bench of Bombay High Court which is hearing a PIL filed by VJAS following large scale starvation deaths among Kolam tribals in Yavatmal five years ago. The local collector on one hand told the court that the state strictly follows the SC 2001 order and updates BPL lists annually. On the other, he admitted that on the ground a 2002 BPL survey is considered for selecting families for food security under the PDS. What’s worse despite deaths, in a clear case of a mockery of the ‘right to food,’ Maharashtra has denied food security to more than a lakh tribal and Dalit BPL families facing malnutrition and starvation in Yavatmal. To highlight this, a huge protest rally is being organised, on December 26th in Pandharkawda, Yavatmal. “These are desperate people battling hunger and death. The government should realise what it means when people with nothing to lose take to the street,” warned Tiwari. This is not a problem of rural Maharashtra alone, in fact it is worse in urban areas. Particularly in Mumbai, the country’s financial capital where a Mumbai University study has already established that how both malnutrition and hunger are much worse than in remote tribal areas. “Mumbai has one of the highest number of hungry in the country. Almost half of our children are malnourished and as per global hunger index (GHI) 2011. Given that India is home to one fourth of world’s hungry, its position is already the worst not only in South Asia, but also among sub-Saharan countries, you know how scary that makes Mumbai look like. It is strange to understand that this should be a problem of the financial capital of India which positions itself as an emerging economic super-power,” pointed right-to-food activist Ananda Pawar who works in Dharavi. The minister for food and civil supplies Anil Deshmukh has often taken the stand that there is limited availability of food under government sponsored schemes. “Despite the shortfall, Maharashtra has one of the best records in food distribution and supply,” he insists but seems at a loss to explain why the BPL lists have not been updated for over a decade. When asked about the regular rotting food grains for lack of adequate storage in government run godowns he passed the buck to the Centre. “We are cracking down on pilferage and losses,” he offered and raised the issue of bogus cards. According to him a state government drive to detect bogus cards which began in 2005 has led to the cancellation of 5.3 million such cards till 2011. Over 3 years, from 2005 to 2008, the state cancelled about 2.9 million cards. Then, over 2009-2010, the government cancelled about 1.2 million cards. Finally, in 2011, during the detection drive, about another 1.1 million were cancelled. Incidentally the government’s own figures show that as on 1st April, 2012, the state had a mere 22 million ration cards in a total population of 112.37 million! Activists however allege that the government raises the bogey of bogus cards only to abdicate from PDS. “This is a ploy to get private players in and throw the poor to their mercy,” says Tiwari. “Even if one goes by 2002 survey figures there are more than 6.6.million BPL families covered under PDS. By claiming three million of these cards are bogus the state’s trying to keep away 50% of such families out of reach of new subsidised food schemes. A garibi-ko-nahin-hata-sakte-toh-garibonko-hatao policy seems to be put into place,” laments Tiwari. 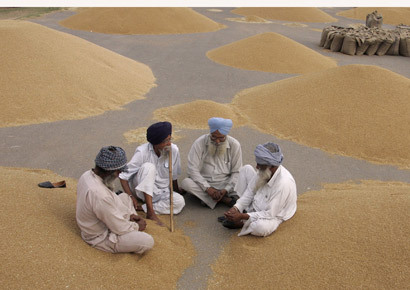 – Over 60% of India’s wheat and 27% of its rice is pilfered from the system before reaching the ration card holder. – Maharashtra has cancelled 5.3 million cards saying they are bogus. – SC guidelines need updating of BPL lists annually. – Less than 25% of the total population in the state has a ration card.